Thank you, Phantom, for blocking his crotch from us. We didn’t need to see that. The Phantom wakes up strapped to a table and trying to fight off the effects of a hallucinogenic drug that causes you to experience your worst fears. This is from the actual pheromones the tiger poachers have been trying to create, and our mystery man from the bar last issue, another brother and not one of the poachers as I thought, has a personal gripe against the Phantom. Years ago he was engaged to a woman who bought lies about the government and the Phantom. When the Phantom came to break up the terrorist group, one of them blew himself up, killing the woman in the process. Now the man, Manuel, blames the Phantom and is planning to slowly torture him to death with this “Manic” drug. 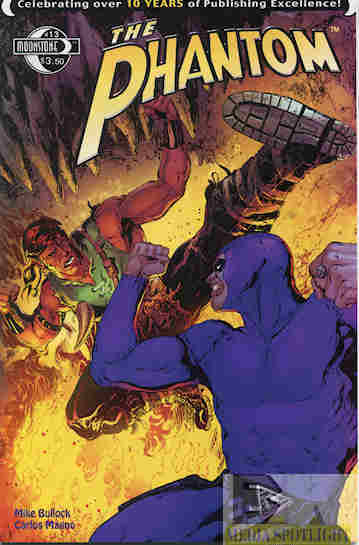 However, the Phantom is able to fight it off and destroy the operation, supposedly killing Manuel in the process. But he’s still alive, although a lot more scarred up. Ed Rhoades’ “Behind The Mask” feature goes into the history about how the Phantom Skull Ring has been depicted in comics and movies. What they got right: Hey, I can tell people apart this issue, and apparently so can the colorist and letterer. The Phantom being hit with essentially Scarecrow’s fear toxin (DC Comics reference) and how he fights against it is a good story idea, and while the idea could have used a longer story, the story itself uses it only as long as it needs to. What they got wrong: Although this doesn’t feel like a “part two” but a completely different story, only barely tied to part one. Also, Rhoades talks about how the Skull Ring was featured in the comic strips, Charlton comics, the old serial, and the 90s movie, but no mention of the cartoons. In Phantom 2040 they had a necessarily less violent way to leave the “death’s head” on targets, building on the high-tech nature of the costume. Recommendation: You don’t really need part one to read part two outside of knowing who Manuel’s brothers and their friend are, which was confusing at times anyway last issue so you’re not missing much. It’s a good story that’s worth checking out. Posted by ShadowWing Tronix on October 27, 2017 in Yesterday's Comics and tagged The Phantom.